National and local governmental representatives of India, Indonesia, Mongolia and Vietnam attended the Policy Development Workshop at the United Nations Conference Centre (UNCC), Bangkok on 5-6 March 2019 in an effort to scale up the Nexus Approach to the national level. In the lead-up to this meeting, several workshops were conducted in 2018 including four Nexus training workshops in India, Indonesia, Mongolia and Vietnam, as well as the panel session on “How can Water-Energy-Food Nexus in Cities Contribute to Mitigating Climate Change?” at UNESCAP’s “Fifth Session of the Ministerial Committee on Environment and Development” to highlight climate actions and the co-benefits of applying an Urban Nexus approach. During the Policy Development workshop, UNESCAP provided a brief overview of the Sustainable Development Goals (SDGs) regional process and roadmap, and introduced participants to relevant activities, tools and data sources. They discussed Urban Nexus topics as a means of implementation to deliver on the global agendas and cited examples of how cross-sectoral and integrated resource approaches in cities can, or have been, incorporated into national policy frameworks and contribute to the achievement of SDGs and climate actions. This workshop was built on the outcomes and feedback from the aforementioned previous workshops. The national and local representatives of India, Indonesia, Mongolia, and Vietnam had the opportunity to present the status of each country’s Voluntary National Review (VNR) and Nationally Determined Contribution (NDC) preparations through an interactive “Market Place”, in relation to the Urban Nexus approach and the projects implemented in the cities. These countries also identified challenges in advancing the integration on all levels and across sectors of the government, taking account of inter-institutional collaboration, knowledge sharing (including data collection), learning and training formats, financing and technological capacity. During the course of the next day, they worked in country groups to find solutions to the identified challenges using the Logical Framework method including indicators and timeframe. India and Indonesia addressed the challenge of strengthening institutional collaboration, while Mongolia and Vietnam addressed that of a sustainable financing mechanism. The participants learned how to apply the Nexus approach in their implementation and reporting of the 2030 Agenda for Sustainable Development and the Paris Climate Agreement. They found the indicators of the Sustainable Development Goals broad and not optimised for implementation. As the implementation and monitoring of the SDG goals are country-led, the countries adapt the indicators to suit their implementation and monitoring plan. Moreover, the countries also have their National Development Plans with accompanying goals and indicators. Often, countries integrate the SDG goals into these National Development Plans and adapt the indicators rather than using the Global Indicators directly. For example, India has four National Development Flagship Programmes: Swachh Bharat, Housing for All, Smart City Mission, and AMRUT. These programmes integrate the SDG goals with the programme’s goal and adjust their indicators for monitoring of implementation progress. 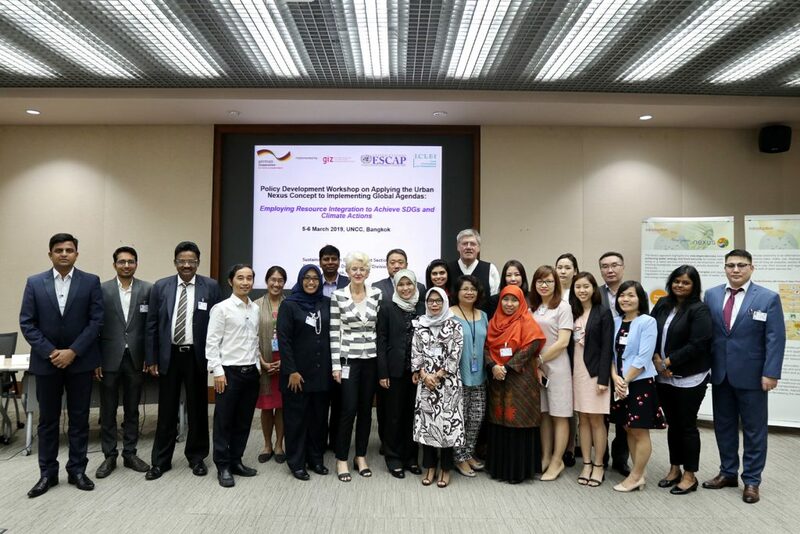 The “Policy Development Workshop” was conducted in the framework of the GIZ “Integrated Resource Management in Asian Cities: The Urban Nexus” project financed by the German Federal Ministry of Economic Cooperation and Development (BMZ). The Urban Nexus project’s political partner is UNESCAP and the implementing partner is ICLEI South and Southeast Asia.